My sprained ankle is almost healed. I can cycle and I don’t feel sore compared to when I walk. My biggest problem is carrying the bike up and down stairs as I am still a little worried about keeping my balance. 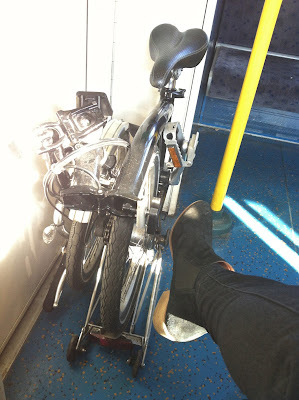 The sprained ankle has made be think about what kind of Brompton I would next buy. Already I know I don’t want to give up the Eazy Wheels. I also noticed that I can carry my Brompton for a longer distance than I thought even with a sore ankle. Our weird weather continues. Lots of bright sun but bitterly cold. Glad you are back in the fray; hope the injury fades away now. In view of your earlier post about cycling in style, how about this as a companion for the stylish? That is an amazing looking bike! Can you just give me a hint as were I can put my details and then follow you (not literally of course, I'm no stalker!). Although I have been doing this for years I have never worked out the subscribing stuff. However I have now added a 'Follow by Email' gadget on the site. Let me know if there are any problems and thank you for wanting to subscribe. I think other readers were subscribing through the old Google reader or Blogger.